Todays modern anesthetic protocols have made anesthesia much safer than in the past. Current pre-anesthetic and inhalant gas anesthetics have reduced the risks associated with anesthesia significantly. We now have reversible anesthetic protocols that we can use to recover patients very quickly for short procedures or when appropriate. Our patient monitors keep track of oxygen, body temperature, heart rate, EKG, respirations and blood pressure to ensure the safest anesthetic experience. Pre-anesthetic exam and blood testing are important in reducing the risks of anesthesia. Regardless of age and health, every pet should have a simple pre-anesthetic blood test performed to ensure the liver, kidneys, and blood counts are healthy enough for anesthesia. 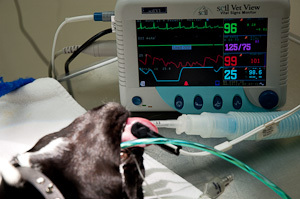 For geriatric or ill pets, a more comprehensive pre-anesthetic workup will be required.